Adobe XD CC 13.1.2 – Experience design reimagined. Adobe XD CC (formerly known as Adobe Experience Design CC) aims to provide full support to UX designers that are trying to improve the way in which users interact with their product. The app allows you to develop both websites and mobile apps and helps you test the outcome and generate prototypes. 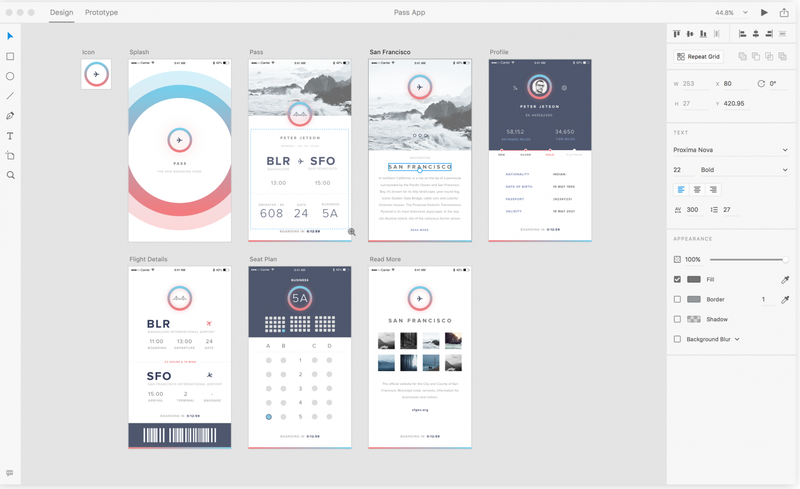 Right off the bat, Adobe XD CC makes you decide if you want to develop projects for iPhone, iPad or web. In addition, you can opt for custom size boards. However, within the designer area, you can add artboards of various sizes. The Adobe XD CC user interface is separated in two main tabs: one that allows you to deal with the design aspect of your project, and the other to help you configure the associated prototype. Adobe XD CC permits you to test the outcome in a separate window, and you get to both interact with and record the activity and share the capture with your client or other team members. Within the Adobe XD CC canvas area, you get to add new elements with the help of basic vector drawing tools, combine them any way you like, import images with simple drag and drop actions, create wireframes, and so on. The same rules apply when adding interactions and animations to your project in the prototype area. Just establish connections between your artboards using the mouse, and employ the contextual menu to manage the animations. Worth mentioning is that, since the Adobe XD CC project is still under heavy development, some of the editing functions one would expect are not yet included, but working with the application is quite intuitive. Adobe XD CC allows you to export your project’s design to a PNG image file, or you can record your interaction with the prototype to an MOV video file. Nevertheless, you can also use your Creative Cloud account to share the prototypes directly with your team. Just use the Share command to generate a public URL and preview the prototype in a web browser. Next story VMware Fusion 11.0.1 – Run Windows apps alongside Mac apps without rebooting. Previous story BBEdit 12.5 – Powerful text and HTML editor. Adobe Dimension CC 2018 2.0 – 3D graphic creation tool. Adobe Media Encoder CC 2018 12.0.0 – Included with Adobe Premier CC 2018. Adobe Premiere Pro CC 2019 13.0.2 – Digital video editing tool.